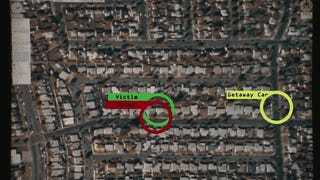 The Center for Investigative Reporting takes a look at a number of emerging surveillance technologies in a new video, but one in particular stands out: A wide-area surveillance system invented by Ross McNutt, a retired Air Force veteran who owns a company called Persistent Surveillance Systems. McNutt describes his product as "a live version of Google Earth, only with TiVo capabilities," which is intriguing but vague (and also sounds a lot like the plot of this terrible Denzel movie). More specifically, PSS outfits planes with an array of super high-resolution cameras that allow a pilot to record a 25-square-mile patch of Earth constantly—for up to six hours. It's sort of similar to what your average satellite can do—except, in this case, you can rewind the video, zoom in, and follow specific people and cars as they move around the grid. It's not specific enough to ID people by face, but, when used in unison with stoplight cameras and other on-the-ground video sources, it can identify suspects as they leave the scene of a crime. The PSS system has been tested in cities including Baltimore and Dayton, and, last year, police officers in Compton used it to track crimes, including a necklace snatching. In one case, they could track a criminal as he approached a woman, grabbed her jewelry, and then ran to a getaway car. They eventually drove out of frame, which meant they weren't caught—but, as the Compton police explain in this video, the system told them that this particular car was involved, at the very least.